Today, I am twenty weeks pregnant (not in that photo, though - in that photo I am 18 weeks pregnant. Remember summer? Also: no, YOU need to cut my grass). 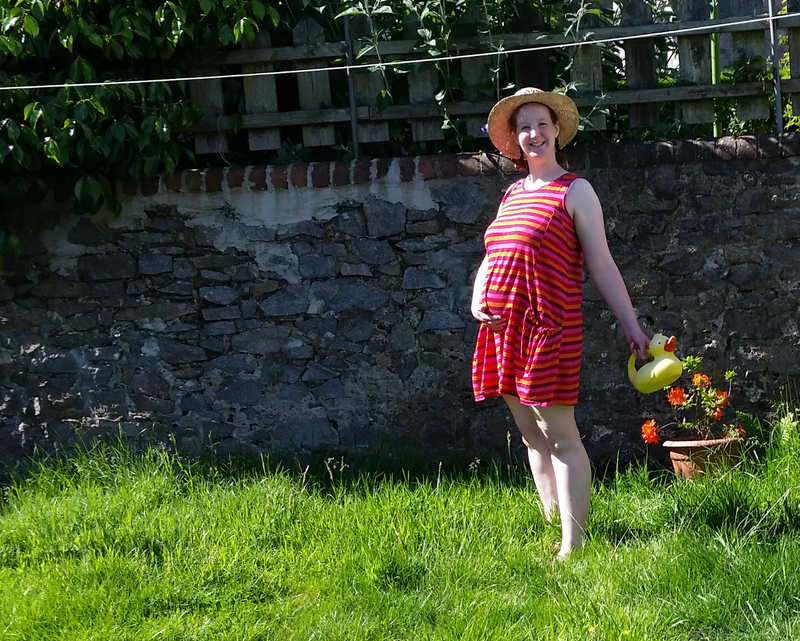 At this point, when I was expecting my first, I did my first "Rooftops Baby FAQs"; I've decided to repeat more or less the same questions this time round. We do. But, no, I'm not going to tell you yet - I want to know what your guesses are first! How are you feeling? How are your hips? Good! Physically, this has been a really easy pregnancy. I've had a few days when I've gone for a nap as soon as Steve got home from work but, otherwise, if I hadn't skipped a period, I wouldn't have known. I'm starting to get odd twinges in my hips, but at this point last time I was a few days away from being signed off work, so still being mobile and almost entirely pain-free seems like some sort of pregnancy miracle (it's NOT a miracle, obviously, but I might write about that at a later date). Emotionally, it's been a bit of a rollercoaster. Between miscarriage flashbacks/fears, some extra tests, exhaustion from caring for Steve and MM during the three weeks they took turns at being ill, exhaustion because oh, hello, last two molars!, the lack of any physical symptoms ("what does it meeeeeeeean?") and just general wacky pregnancy hormones, my mood's been a bit up and down. It seems to be evening out now, though; it's a while since I last wanted to chuck Steve because he can't push a lightweight dining chair under a sodding table. I really want cake with raspberry jam in it and anything in the least bit coconutty. Both of these are standard period symptoms for me, though, so not particularly noteworthy! I've not got any proper aversions, although - as with last time - I don't much like taking liquid on board and Digestives give me heartburn. Yes, it's just a massive bump. By eight weeks, I was using a hairband to fasten my jeans; goodness knows what I'll be squeezing into by the time I reach eight months. A duvet cover with a few holes cut out, perhaps? Yes, although it's very different from last time! With MM, I could feel little bubbles at thirteen weeks and definite jabs a few weeks after that; this time, it's more like something stroking me on the inside - I've been feeling it since week fourteen but it's only very recently that I've been able to say with absolute certainty that it isn't just wind! A straightforward one. I've got lots to say about this over the coming months, believe me! Excited and slightly stunned, despite it most definitely having been planned! Thrilled. She had been asking for a baby for ages (thanks to a couple of her pals becoming big siblings), so she's very pleased. Almost every day, she asks to look at photos from when I was heavily pregnant with her and of her as a newborn; she is using them, plus a few books and some firsthand encounters, to piece together what babies do (current understanding: sleep; cry because they don't have the words to explain their problems; learn to crawl - which pretty much covers the basics, right?). She sometimes says hello to the bump and is impatient to feel it move. Fingers crossed she stays happy with the situation when the baby actually arrives! Ugh, politics, curse them. More pleasantly: our garden. I'll also do a good job of listening to whatever's going on in your life (before turning the conversation back to me). I was so gutted that the lovely community midwife I had with MM is no longer with my local surgery. Luckily, my new midwife is equally lovely although our appointments are much, much shorter because a) she doesn't go off on great long, highly entertaining tangents about her own kids, and b) every time she offers me information about anything I wave it away in a breezy "been there, done that" manner which I really HOPE is less annoying than it sounds. I spent about two hours the other day reading all my blog posts from my last pregnancy. I also read Matilda's birth story and what I wrote about her being in the neonatal unit (both currently set to private) - both of which made me cry. I was so scared when I wrote all that that I was being hopelessly naive by anticipating liking parenthood but I'm happy to report that, for the most part, it's much better than I dared to hope ("the most part" does not include teething). So far, the hardest part of this pregnancy (bar anxiety) has been getting MM off my yoga ball so that I can have a turn. None of that "I'm so uncomfortable at 39 weeks that I'm admitting defeat and inflating my yoga ball" nonsense - I had it pumped up by week ten, prevention, cure, etc. Oh, no, actually, the most hardest part of this pregnancy was throwing the positive test in the bin. It felt a bit callous - not to mention unlucky - to chuck out the only proof of my baby's existence. The day I tested positive, the zygote was the size of a poppy seed. I had just planted poppy seeds in the garden. They are tiny. I cried. Elise has given the baby the temporary name of Xenon. She says temporary but her parcels to MM all still come addressed to "Spartacus", so, really, who knows? !